If anything is going to tear their eyes away from the family iPad screen, it’s going to be a super cool toy, and it doesn’t get much cooler than a kids’ robot, right? Think BB-8, the endearingly cute droid from Star Wars or Cozmo, a robot so futuristic its personality evolves the more it hangs out with you. 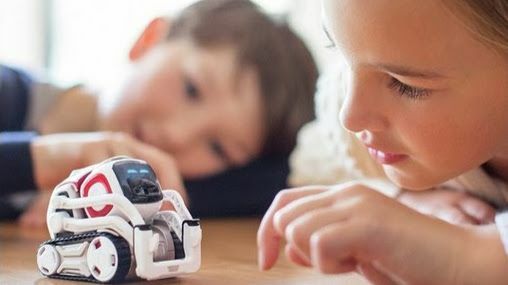 From robots with full on personalities to pet dinosaurs that can respond to hand gestures, when it comes to choosing the best children’s robot for your kid, you’ll need to think about whether they’re going to want something basic, or one that they can engage with on a more intelligent level (using apps to learn and write basic coding). The most advanced robots on our list require you to download an app, and these tend to be the most expensive. For something more basic and budget friendly, check out the Fisher-Price Think & Learn Teach 'N Tag Movi, especially if you have younger children or the 4M Kidz Labs Tin Can Robot, because who doesn’t like the idea of building a robot out of a tin can on a Saturday afternoon? What’s cooler than a toy robot? Oh yeah, a Star Wars BB8 toy robot! Okay, back away from BB-8. you’re buying this one for your kids remember? So no matter how cool it is, you’ll have to hand it to your eagerly awaiting children in the end. BB8 offers you the best of both worlds; you kids can control the robot via an app but it also has a mind of its own, with an adaptive personality that evolves as you interact with it. BB-8 listens and responds with a range of expressions. With pretty much 5 star reviews all round, you’re onto a winner and a fail-safe gift idea. If you’ve got a mini computer programmer or website coder at home, you should consider investing in the Wonder Workshop Dash Robot, which will give them an early introduction to code. If you’re worried that they’ll get bored in 5 minutes, you can be reassured by both the Wonder and Blockly apps, which encourage the familiarisation of code through games and adventures. While the BB8 requires additional battery expenses, Dash’s batteries are rechargeable, so it doesn’t matter how many hours of fascination it induces. So Cozmo may be expensive but so is a puppy and if they want something that badgers them to play while retaining an adorably cute facade, we reckon Cozmo will make an awesome alternative. Your kids can even look after him like a fully fledged pet, with programmable options, full facial recognition, and adaptable personality and responses just some of his intelligent capabilities. For all the fun without the responsibility, Cozmo is the best. If you can’t quite justify spending over £100 on your children – and actually, we don’t blame you for weighing up outlay vs probability of it being broken – then the WowWee is a great little find. It follows hand gestures, you can control it using an app and it has a responsive, interactive personality. Although you may be spending a fair amount on batteries, if you’re savvy about bulk buying, the additional outlay shouldn’t come to much. Don’t make Dino Boomer angryyy! Don’t underestimate this little dinosaur. No seriously, if you pull his tail he WILL get angry! Boomer is fully interactive, so if he does get angry, you can use hand gestures to tame him or your kids can control him using the control pod…although we can’t actually guarantee that he won’t try and resist it. With some happy parents mentioning that it’s still a novelty after 2 years, Dino Boomer should be money well spent. When it comes to artificial intelligence, MAX is up there with the big guns at the top, the only reasons why he’s coming in a little lower down the list is you have to build him first. If your kids love their lego, they’ll love helping you to build MAX and once you have assembled him, he’ll interact with your kids on an intellectual level. They’ll be able to talk to him about science and technology, play games with him and ask him to tell them a joke. In addition to being AI, he’s fully controllable, making him an incredibly versatile robot. With 14 different designs to make, the RED5 shouldn’t fail to keep them amused. Whether they’re attempting to build the Turtle-Bot, the Beetle Bot or even the advanced Crab-Bot, this clever robot harnesses the sun’s rays to power itself no matter the life form they recreate. Although the robot is fairly limited in its movements, there’s certainly a sense of achievement when you complete it and the little thing starts scuttling its away across the surface. So far, the robots on our list have been a bit too advanced for the littlest kids to relate to. However, Fisher-Price have done what they do best and invented a cool, fun, easy to navigate toy that also plays a vital part in developing necessary skills. Whether they’re playing active games, learning to follow directions or developing their critical thinking skills, this little robot will help to ensure they’re ready for their first day at big school. Who knew you could have so much fun with a tin can? For a little bit of fun and some interactive time with your child, this Tin Can Robot is just the ticket. Once it’s been put together, you can both have a laugh as you watch it awkwardly bumble around. While we can’t guarantee that it’ll have the entertainment factor of other robots on our list, if you’re looking to test the waters or peak their interest, this kids robot under £20, it certainly a good start out. If they’re getting bored of doodling themselves, they could always build a robot and watch that do it instead? If you’re looking for a simple, cheap robot for kids that delivers more at the end result, this doodling robot could be the answer. It’s simple enough for them to try and build themselves and once complete they can load it up with pens and watch as it crawls around the page. For young children, there’s the benefit of seeing their creation come to life, however older children may find the concept too simplistic for lengthy entertainment.